In 1931, Kirby Emerson Tyndall, a native of Jones County and son of the late Lewis Henry and Emma Howard Tyndall, came to Mount Olive and established Tyndall Funeral Home, the first funeral home in this area. The first location for the business was on the east side of the 100 block of North Center Street. In those days much of the embalming and most of the funerals were done at home. In 1938, Tyndall purchased the home of the late R. J. “Bob” Sutherland at 108 West Main Street. He relocated the business to that location where it remained until 1964. Kirby Tyndall passed away in 1949. After his death, a corporation was formed by his widow, Fisher Tyndall, J.S. “Jim” Glenn, and Willis B. Honeycutt. Mr. Glenn was also the owner of Glenn-Martin Drug Company. Mr. Honeycutt was the embalmer for the corporation at that time. The corporation then became Tyndall Funeral Home, Inc. Mrs. Tyndall served as president until her retirement in 1969; Mr. Glenn served as vice-president; and Mr. Honeycutt served as secretary-treasurer and manager until his death in 1966. In 1964, Tyndall Funeral Home purchased a piece of land from Norman Holloman on North Church Street Extension and built a new facility. The modern facility included a large chapel, with a seating capacity of about 300, and a private family room. A formal open house was held on June 20-21, 1964. After the death of Mr. Honeycutt in 1966, Mr. And Mrs. Norwood Odom purchased a share of ownership of the funeral home and Mr. Odom assumed the duties of manager, funeral director, and embalmer. Mr. Odom had been associated with the funeral home in the capacity of funeral director and embalmer since 1962. After the passing of Mr. and Mrs. Glenn, Odom acquired an additional share of the business. Subsequent to the retirement of Mrs. Fisher Tyndall Morton, Mrs. Morton’s brother, John Thurman Davis, who was affiliated with the funeral home at that time, purchased Mrs. Morton’s part of the business. Mr. Davis served as assistant manager until his retirement, due to poor health, in 1979. He also served as vice president until his death in 1984. 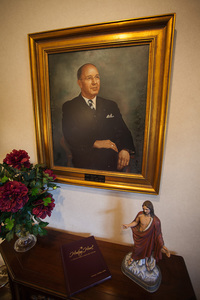 Norwood Odom served as president and manager of the funeral home until January 1987. At that time, he sold his interest in the business to Seymour Funeral Home. Mr. Odom retired in March, 1989, and worked part-time as the funeral home’s embalmer. John T. Davis, Jr. was named president and later, manager. In 1988, the funeral home bought the property of the late William Jackson that adjoined its property and built a large lighted parking lot. In May 1991, the funeral home added a major addition to their existing building. Mr. Davis retired in 2015 after 40 years of service, and he continues to assist families part time as a partner and director at the funeral home. Following Johnny Davis’ retirement, Dwayne Summerlin was named vice-president and manager of the business. Tyndall Funeral Home has carried on its tradition of personal concern, attentive service, and deep compassion for families who have suffered the loss of a loved one. We continue to bring a new level of personalization and unique service options to those interested in traditional burial or cremation. We pledge to maintain the ideals upon which our company was founded: The highest ethical standards, caring attention to your needs, and an ongoing commitment to supporting and building our community.